Recommended paint systems - Which paint is right for your project? Simply select the area you are planning to paint to view the recommended paint systems for your project. The better the preparation the better the resulting paint finish. While this may conjure up images of hours of tedious sanding and scraping, this shouldn’t be the case for most DIY projects. This brochure simplifies and explains the typical steps you will need to follow before painting. At Resene we stock quality preparation tools and application equipment matched to our recommended paint systems. This is the essence of what we call Resene Best System Selling. The following are important steps that need to be followed before applying paint. It isn’t by any means exhaustive but should cover the key areas for you, together with recommendations for the equipment you will need. At Resene we are happy to inspect your own brushes and rollers and other painting equipment to make sure they are suitable for your planned decorating project. The key steps for preparing interior and exterior surfaces are described below. Data Sheet references are included in this brochure for quick reference – for example, (D52) refers to Data Sheet number D52. We recommend you take the time to read product and accessory labels before use and if you are unsure about any aspect of your project and would like additional information or tips, or would like copies of the Data Sheets referred to, please contact Resene. Download this information as a pdf file. You will need Acrobat Reader. Washing before painting interior walls, ceilings and joinery etc is good practice to remove any fly dirt, dust and other contaminants. In most situations this means simply wiping using a clean lint-free cloth and a solution of warm water and Resene Interior Paintwork Cleaner or a mild detergent. Sanding walls and ceilings is not usually necessary unless the surface has imperfections and/or flaking paint that needs to be sanded smooth, or if the existing paint system is an old enamel system 1. If it is an enamel system, commonly used in kitchen and bathroom areas and on joinery and doors, first remove any grease and oil using sugar soap and sand the areas to degloss the surface and provide a key for the paint to adhere to. Alternatively Resene Waterborne Smooth Surface Sealer (D47a) could be used eliminating the requirement to sand. Note 1: Pen marks will need to be sealed with either Resene Sureseal (D42) or Resene Enamel Undercoat (D44) as they will bleed through waterborne paints. Note 2: You can check whether the paint finish is an enamel system by rubbing the paint surface with meths. If it removes some of the coating then it is most likely waterborne and a Resene paint system can be applied directly onto the clean surface without sanding. Any holes or voids, such as those left in wallboards by picture hooks, should be filled, and once dry, sanded smooth. Unless the hole in the wallboard is large (say bigger than the palm of your hand) it will not usually need sealing or priming before painting. For timber joinery it is good practice to spot prime voids and holes, such as punched nailheads, before filling and then reprime once filled and sanded. 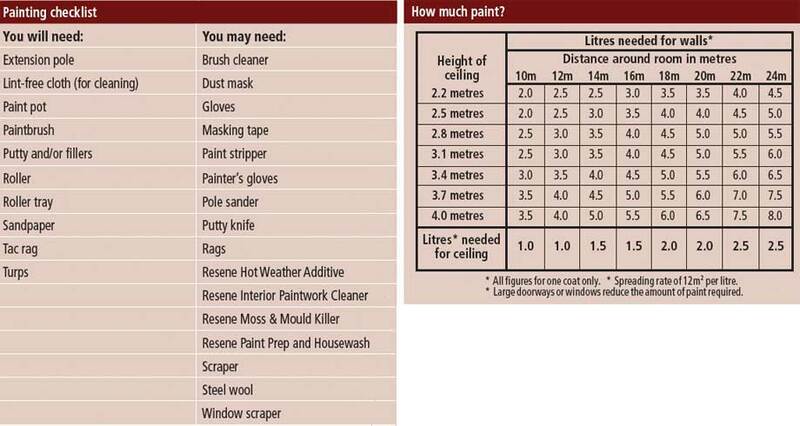 The tables below are guides to the most suitable sandpaper, fillers and primers/sealers to use. You are now ready to paint. (e.g. picture hook holes) Selleys Rapidfilla PAL Contract Filler Ask your Resene ColorShop staff or contact the Resene helpline for advice if the wallboard itself has been damaged or punched through. New paperfaced plasterboard Level 4 Ensure surface is sanded smooth. Seal with Resene Broadwall Waterborne Wallboard Sealer (D403). Once dry fill any gaps or voids. Resene No.1 roller sleeve. 220 grit zinc stearate sandpaper. Lightly sand after applying Resene Broadwall Waterborne Wallboard Sealer (D403) to remove any nibs or rough areas. New paperfaced plasterboard Level 5 Ensure surface is sanded smooth. After sanding, apply Resene Broadwall Surface Prep & Seal (D807). Once dry fill any gaps. Resene High Solids roller for Resene Broadwall Surface Prep & Seal (D807). Resene No.1 roller sleeve for sealer. 220 grit zinc stearate sandpaper. A level 5 finish is recommended for areas with critical light issues and for use under metallics. If a level 5 finish has already been achieved by a plasterer, Resene Broadwall Surface Prep & Seal (D807) is not required, but a sealer such as Resene Broadwall Waterborne Wallboard Sealer will be. Wet areas Replace Resene Broadwall Waterborne Wallboard Sealer (D403) with either Resene Sureseal (D42). Stripping wallpaper After removing wallpaper, roughly sand to remove surface imperfections. Fill any dents and scraper cuts. Apply Resene Sureseal (D42) followed by Resene Broadwall Surface Prep & Seal (D807) lightly sanding between coats. Fill gaps after sealing. SIKA Fill That Gap or Selleys RapidFilla. 100-150 grit sandpaper (depending on how rough the wall is), 220 grit sandpaper for sanding Resene Broadwall Surface Prep & Seal (D807). Resene Sureseal (D42) will hold back stains from yellowed wallboard and residual glue that will bleed through waterborne paints. Resene Broadwall Surface Prep & Seal (D807) will significantly improve the finish. An alternative is to use lining paper. Repaints Wash using Resene Interior Paintwork Cleaner (concentrate) correctly diluted with water and a lint-free cloth to remove dirt, marks, etc. Fill any voids, holes from picture hooks, etc. SIKA Fill That Gap. Resene Interior Paintwork Cleaner (concentrate). 220 grit sandpaper. Repainting a wall in good condition is straightforward. 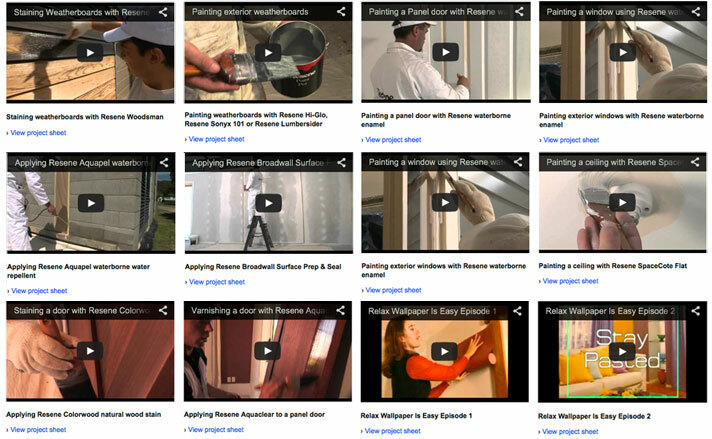 Resene paints will stick to most surfaces without the need to sand. Sugar soap may be needed to remove grease or oil residues, particularly in kitchen areas. Vinyl wallpaper Wash using Resene Interior Paintwork Cleaner (concentrate) correctly diluted with water and a lint-free cloth to remove dirt marks. Fill any voids and dents using Selleys Rapidfilla. Stick back any lifting wallpaper using PVA Adhesive. PVA Adhesive. Resene Vinyl Wallpaper Sealer (D406). After 4-5 weeks plasticisers from the vinyl wallpaper can leach through waterborne paints making them tacky to touch. Resene Vinyl Wallpaper Sealer (D406) will seal in the plasticiser and prevent tackiness occurring. Living room Resene SpaceCote Low Sheen (D311). Resene Zylone Sheen or Resene Zylone Sheen VOC Zero (D302). Resene No.1 roller sleeve. Cutting in brush. Living rooms need the hardest paint finish. Resene SpaceCote Low Sheen (D311) is a waterborne enamel and more hardwearing than standard waterborne paints. Kitchen Resene SpaceCote Low Sheen Kitchen & Bathroom (D311K) or Resene SpaceCote Low Sheen (D311). Resene Lustacryl Kitchen & Bathroom (semi-gloss – D310K), Resene Lustacryl (semi-gloss – D310) or Resene Room Velvet (low sheen – D320). Cutting in brush. The system needs to be hardwearing, cleanable and able to resist steam from kettles, pots etc. Resene SpaceCote Low Sheen Kitchen & Bathroom (D311K) and Resene Lustacryl Kitchen & Bathroom (D310K) combine anti-bacterial silver protection with the mould inhibitor MoulDefender. Open plan kitchen/living area Resene SpaceCote Low Sheen (D311) or Resene SpaceCote Flat (D314). Resene Zylone Sheen or Resene Zylone Sheen VOC Zero (D302). Resene No.1 roller sleeve. Cutting in brush. The system needs to be suitable for both kitchen and living areas as they share common walls. Resene SpaceCote Flat (D314) is a good option if the walls are large and subject to a lot of critical light. Master bedroom Resene SpaceCote Flat (D314). Resene Zylone Sheen or Resene Zylone Sheen VOC Zero (D302). Resene No.1 roller sleeve. Cutting in brush. Resene SpaceCote Low Sheen (D311) could also be used. Child's bedroom Resene SpaceCote Low Sheen (D311). Resene Zylone Sheen or Resene Zylone Sheen VOC Zero (D302). Resene No.1 roller sleeve. Cutting in brush. See the Resene KidzColour chart for a range of children’s colours. A metallic finish using Resene Enamacryl Metallic (D309a) or special finishes, such as Resene Blackboard Paint (D901) or Resene Magnetic Magic (D902), may be an option. Hallways and stairwells Resene SpaceCote Low Sheen (D311). Resene SpaceCote Flat (D314). Resene No.1 roller sleeve. Cutting in brush. Critical light, especially in stairwells, can be an issue. Dining room Resene SpaceCote Flat (D314). Resene SpaceCote Low Sheen (D311). Resene No.1 roller sleeve. Cutting in brush. A dead flat finish imparts a subtle sophisticated finish especially in strong colours. (wet areas) Resene SpaceCote Low Sheen Kitchen & Bathroom (D311K) or Resene SpaceCote Low Sheen (D311). Resene Lustacryl Kitchen & Bathroom (semi-gloss – D310K) or Resene Lustacryl (D310) or Resene Room Velvet (low sheen – D320). Resene No.1 roller sleeve. Cutting in brush. The walls may need wiping after the first couple of showers. Resene SpaceCote Low Sheen Kitchen & Bathroom (D311K) and Resene Lustacryl Kitchen & Bathroom (D310K) combine anti-bacterial silver protection with the mould inhibitor MoulDefender. Wet areas Resene SpaceCote Flat Kitchen & Bathroom (D314K) or Resene SpaceCote Flat (D314). Resene SpaceCote Low Sheen Kitchen & Bathroom (D311K) or Resene SpaceCote Low Sheen (D311) or Resene Ceiling Velvet (D321). Resene No.1 roller sleeve. Cutting in brush. The paint needs to resist steam from showers etc. Resene SpaceCote Flat Kitchen & Bathroom (D314K) and Resene SpaceCote Low Sheen Kitchen & Bathroom (D311K) combine anti-bacterial silver protection with the mould inhibitor MoulDefender. Open plan kitchen/living area Resene SpaceCote Flat Kitchen & Bathroom (D314K) or Resene SpaceCote Flat (D314). Resene Ceiling Velvet (D321). Resene No.1 roller sleeve. Cutting in brush. As the ceiling area is larger than normal a dead flat finish is recommended. Other areas Resene Ceiling Paint (D305). Resene SpaceCote Flat (D314). Resene No.1 roller sleeve. Cutting in brush. Ceiling paint may be applied in a single coat for repaints. When a coloured finish is preferred Resene SpaceCote Flat (D314) is recommended. Doors, joinery, shelving, cupboards, skirting boards* Resene Lustacryl (semi-gloss – D310) or Resene Enamacryl (gloss – D309) waterborne enamels. Resene Lusta-Glo (semi-gloss – D33) or Resene Super Gloss (gloss – D32) traditional solventborne enamels. Legend or Basil brush. Resene Hot Weather Additive for waterborne paints. Turps for solventborne paints. The higher the gloss level of the paint the more imperfections, such as filled nailheads, are highlighted but the more vibrant the colour will look, especially in strong colours. * When Resene SpaceCote is used on the walls the colour can be extended to include the skirting boards. Joinery, new and stripped Resene Aquaclear (waterborne polyurethane – D59) or Resene Qristal Clear (solventborne polyurethane – D52). Resene Colorwood (D50a) for colour or Resene Danska Teak Oil (507) to enhance the grain in hardwoods. Legend or Basil brush. Resene No.4 Easy Reach roller. Speedbrush. Hot Weather Additive for Resene Aquaclear (D59) or turps for Resene Qristal Clear (D52). Resene Aquaclear (D59) is a waterborne polyurethane while Resene Qristal Clear (D52) is a traditional solventborne polyurethane. Depending on the look or finish desired the Resene Colorwood (D50a) or Resene Danska Teak Oil (507) may not be required. Recoating existing varnish Resene Aquaclear (waterborne polyurethane – D59). Resene Qristal Clear (solventborne polyurethane – D52). Legend or Basil brush. Resene No.4 Easy Reach roller. Speedbrush. Resene Hot Weather Additive for Resene Aquaclear (D59) or turps for Resene Qristal Clear (D52). Thoroughly sand the area to be coated and apply the polyurethane. Lightly sand between each coat. Refer to Resene ColorShop staff or call the Resene helpline for recommended flooring systems. Most exterior surfaces, except bare galvanised iron, will have mould, and possibly moss, growing on them. It is not enough to remove moss and mould without first killing it as any residual spores will simply grow back underneath the new paint causing it to flake off. To treat, simply use a garden sprayer to apply Resene Moss & Mould Killer (D80). Wait a few hours for the solution to take effect and thoroughly scrub off. The purpose of washing is to remove contaminants, such as dirt, salt, mould residue (now it’s been killed), poorly adhered paint and chalkiness, from old painted surfaces. The most effective way is to use Resene Paint Prep and Housewash (D812) or if you are painting a roof, Resene Roof and Metal Wash (D88). Simply wet the area with fresh water and wash using a soft bristled brush as you would a car. If you are preparing windows use a scouring pad or a 3M stripper pad. A short bristled scrubbing brush is ideal for unpainted concrete and plaster. Rinse clean with fresh water. Waterblasting is useful for hard surfaces, such as concrete and galvanised iron, particularly when paint layers need to be removed. However as a cleaner it is less effective than Resene Paint Prep and Housewash (D812) and when used on timber can damage it. Waterblasting is not recommended for joinery. An alternative is to use a wire brush or stripper pad to remove flaking paint from concrete particularly if only small areas are flaking. A 3M stripper pad is ideal for removing flaking paint and mild rust from galvanised iron – avoid using a wire brush on galvanised iron as it will damage the surrounding protective zinc layer. If the old paint surface is sound and `deglossed´ then it typically will not need to be sanded. An exception to this is where old enamels have not been exposed to U.V. light and are hard, embrittled with age and have retained much of their original gloss – usually on the opening edges of window joinery and under eaves etc. Refer to the Sanding chart. Flaking paint will need to be scraped off. Once done, sand back to a sound surface ensuring the paint edges are feathered. Note: 1: It is important to spot prime any bare timber the same day as it is sanded and before any filling to prevent overnight dew lifting the newly feathered paint edge. Note 2: It is good practice to rinse areas with clean water before painting commences each day to remove any salt deposits – especially within 1.5km of the sea. Imperfections and repaired areas, such as punched nails and cracks in timber and plaster, will need to be filled, and in some cases sanded, before spot priming or painting can commence. The following chart identifies the most appropriate fillers for exterior use. The product packaging also recommends where and how to use. You are now ready to paint. No matter how you select your colours, always use testpots to confirm your choices in the area you are planning to paint. Resene testpots are available from your local Resene ColorShop or Reseller or you can order online. A Resene CoolColour looks like a normal colour but thanks to special pigment technology it reflects more of the sun’s energy, so it doesn’t get as a hot as a standard colour would. The colours work by reflecting energy in the near and far infra-red region of the spectrum even though they absorb strongly in the visible region. Resene CoolColour technology is available in a range of Resene premium paints and stains suitable for a wide range of exterior projects, especially where dark colours are planned. Ask your Resene ColorShop staff whether a Resene CoolColour finish is right for your project. Resene CoolColour technology is available in a range of Resene premium paints suitable for a wide range of exterior projects, especially where dark colours are planned. Ask your Resene ColorShop staff whether a Resene CoolColour finish is right for your project. New weatherboards, bargeboards etc Resene Hi-Glo (gloss – D31) or Resene Sonyx 101 (semi-gloss – D30). Resene Lumbersider (low sheen – D34). Legend 63mm-88mm brush. See above for extra preparation required. Resene Hi-Glo (D31) and Resene Sonyx 101 (D30) have similar durability and better cleanability than Resene Lumbersider (D34). Consider using a Resene CoolColour™ for darker colours. Old weatherboards, bargeboards etc Resene Sonyx 101 (semi-gloss – D30). Resene Lumbersider (low sheen – D34). Legend 63mm-88mm brush. See above for extra preparation required. The higher the gloss the more imperfections in the weatherboards will be highlighted. Consider using a Resene CoolColour for darker colours. Exterior windows, doors etc Resene Lustacryl (semi-gloss – D310) or Resene Enamacryl (gloss – D309). Resene Super Gloss (traditional enamel – D32). Legend 35mm-50mm cutting in or standard brush. Resene Hot Weather Additive. See above for extra preparation required. The waterborne enamels are more U.V. resistant than traditional enamels. Consider using a Resene CoolColour for darker colours. Mediterranean/Art Deco style home Resene AquaShield (flat – D601). Resene Lumbersider (low sheen – D34) or Resene Sonyx 101 (semi-gloss – D30). Resene No.1 or No.2 roller sleeve depending on how textured the surface is. Resene AquaShield (D601) suits these housing styles and has the benefit of being self-cleaning. Consider using a Resene CoolColour for darker colours. Stucco/concrete Resene Sonyx 101 (semi-gloss – D30) or Resene Lumbersider (low sheen – D34). Resene AquaShield (D601) for flat Mediterranean look. Resene X-200 (D62) if weathertightness is an issue. Resene No.2 or No.3 roller sleeve. Lambswool roller sleeve for Resene X-200 (D62). Choose between Resene Sonyx 101 (D30) and Resene Lumbersider (D34) based on the preferred gloss level. Consider using a Resene CoolColour for darker colours. Contemporary home Resene Sonyx 101 (semi-gloss – D30) or Resene Lumbersider (low sheen – D34). Resene Sandtex (D71) if there are surface imperfections. Resene No.1 or No.2 roller sleeve and Hi Solid roller for Resene Sandtex (D71). Stronger colours (including metallics) are often used and would suit a higher gloss. Compressed cement panels are usually screw fixed and Resene Sandtex (D71) can help disguise this. Alternatively refer to Resene. Consider using a Resene CoolColour for darker colours. Concrete block Resene Sonyx 101 (semi-gloss – D30) or Resene Lumbersider (low sheen – D34). Resene X-200 (low sheen – D62). Resene No.3 roller sleeve. Resene lambswool roller sleeve for Resene X-200 (D62). Two to three coats of Resene X-200 (D62) should be recommended if weathertightness is an issue. Most colours are available. Consider using a Resene CoolColour for darker colours. Soffits Resene SpaceCote Flat (flat – D314) or Resene Lumbersider (low sheen – D34). Continue selected wall paint system over the soffit. Depending on profile and size, a nook and cranny roller or a standard roller using a Resene No.1 roller sleeve could be used. Soffits and exterior 'ceilings' vary greatly. If they are large, as in many modern homes, a white or off-white soffit will offset interior neutral tones well. Staining Resene Waterborne Woodsman (D57a). Resene Woodsman Wood Oil Stain (D57). 63mm-88mm Legend or Basil brush. Both stains are penetrating and are easily recoated in future years (unlike surface forming stains). The Resene Waterborne Woodsman (D57a) is available in a wider range of colours and is more U.V. resistant. Consider using a Resene CoolColour for darker colours. Garage doors (woodstain finish) Resene Kwila Timber Stain (D501) or Resene Furniture and Decking Oil (D503). Resene Waterborne Woodsman (D57a) or Resene Woodsman Wood Oil Stain (D57). Legend 63mm-88mm brush or Resene brush. Turps if using solventborne product. Many doors are coated using a lightly pigmented surface forming exterior varnish. This must be removed before a penetrating stain is applied. Kwila decks Resene Kwila Timber Stain (D501) or Resene Woodsman Decking Oil Stain (D57D). Resene Woodsman Wood Oil Stain (D57). Initially best brushed using a 75mm-100mm brush. Subsequent coats may be rolled using a Resene No.5 mohair roller sleeve. Use multiple coats if applying over greyed (aged) hardwoods. Resene Woodsman Decking Oil Stain (D57D) or traditional Resene Woodsman Wood Oil Stain (D57) has alternative colours to the reddish/brown of the Resene Kwila Timber Stain (D501). Use Resene Woodsman Decking Oil Stain (D57D) or traditional Resene Woodsman Wood Oil Stain (D57) over pine decking. Pergola Resene Lumbersider (low sheen – D34). Resene Sonyx 101 (semi-gloss – D30). 50mm-75mm Legend brush and/or a long reach roller with a Resene No.1 or No.2 roller sleeve depending on surface profile. Resene Lumbersider (D34) is self-priming. Refer to priming table. Asphalt driveway Resene Blacktop (D304). - Hi Solid roller sleeve. Not many people are aware that asphalt is easily reconditioned using Resene Blacktop (D304). Concrete paths and driveways including stamped concrete and pavers Resene Concrete Stain (coloured – D58). - Resene No. 5 mohair roller sleeve A non-skid option for paths only is Resene Non-Skid Deck & Path (D313). Hardwood furniture Resene Furniture and Decking Oil (D503). Resene Kwila Timber Stain (D501). Turps for clean-up, painter’s gloves. Will require annual application. Not suitable if surface forming stains have already been applied. New Zincalume, including garage doors Resene Hi-Glo (gloss – D31) or Resene Hi-Glo CoolColour (D31C), or Resene Summit Roof (semi-gloss – D315) or Resene Summit Roof CoolColour (semi-gloss – D315C). Resene Sonyx 101 (semi-gloss – D30). Resene Roof and Metal Wash (D88). Roof roller kit if painting a corrugated roof. New Zincalume (and galvanised iron) has a form oil on the surface that must be removed before painting. Weathered Zincalume or galvanised iron Resene Hi-Glo (gloss – D31) or Resene Hi-Glo CoolColour (D31C), or Resene Summit Roof (semi-gloss – D315) or Resene Summit Roof CoolColour (semi-gloss – D315C). Resene Sonyx 101 (semi-gloss – D30). Resene Roof and Metal Wash (D88). Roof roller kit if painting a corrugated roof. After 4-6 months galvanised iron and Zincalume start to weather and white rust (Zn Oxide) will form. Waterborne primers like Resene Galvo-Prime (D402) do not perform as well as traditional solventborne products on aged galvanising. Previously painted Resene Hi-Glo (gloss – D31) or Resene Hi-Glo CoolColour (D31C), or Resene Summit Roof (semi-gloss – D315) or Resene Summit Roof CoolColour (semi-gloss – D315C). Resene Sonyx 101 (semi-gloss – D30). Resene Roof and Metal Wash (D88). Roof roller kit if painting a corrugated roof. Most roof repaints are straightforward unless there is a lot of flaking paint and/or red rust present. Concrete, terracotta, Decramastic and asbestos roofing Please refer to Resene ColorShop staff or the Resene helpline for advice. Watch and learn with our free step by step videos. View recommended paint application techniques for a range of painting projects – staining or painting weatherboards, painting interior walls, trim, joinery, ceilings and much more. Print and use the project worksheets as a handy reference for your decorating project.